To access to the localization function, open the General options dialog box. On the first tab Miscellaneous, there is a Frame called Handling. In this frame, you can choose the menu language. 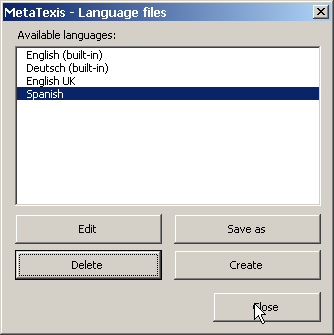 Besides the built-in English and German languages, all language files located in the MetaTexis language directory are listed in the drop-down box (without their extensions). 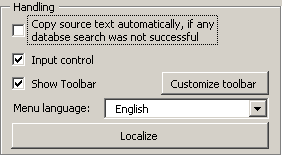 All available languages are displayed in this dialog box: The two built-in languages plus all other language files found. If a built-in language is selected, the Edit and Delete command buttons are disabled, and you can only save them as a language file or create new language files. You can also edit and delete those languages that are not built-in. · To save the language selected as a language file (including the built-in ones), click the Save as button. This function is needed if you want to translate a language file on the basis of an existing language, or if you want to make a variant of an existing language. · To create a new empty language file, click the Create button. This function is useful if you want to translate MetaTexis using the built-in language file editor. · To edit the selected language file with the built-in language file editor, click the Edit button (see next section). · To delete a language file, select it and click the Delete button. Note that if no copy is present in another place, all information in that language file will be lost.